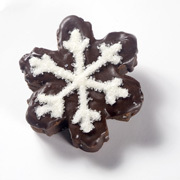 Enjoy the magic of falling snowflakes, crafted from Simply Divine Brownie base, double dipped in sweet, dark chocolate, and piped with icy sugar crystals. Each snowflake is individually wrapped in cellophane and tied with a ribbon. We guarantee our snowflakes will melt on your tongue! Ingredients Base: Dark brown sugar, unsalted butter, fine chocolate (unsweetened and semisweet), eggs, enriched bleached flour, vanilla, kosher salt, baking powder. Decoration: Fine dark chocolate, sugar crystals, white candy writer (sugar, palm kernel oil, cocoa, non-fat dry milk, dry whole milk, glyceryl lacto eaters of fatty acid, salt, artificial coloring).